Hello everyone! 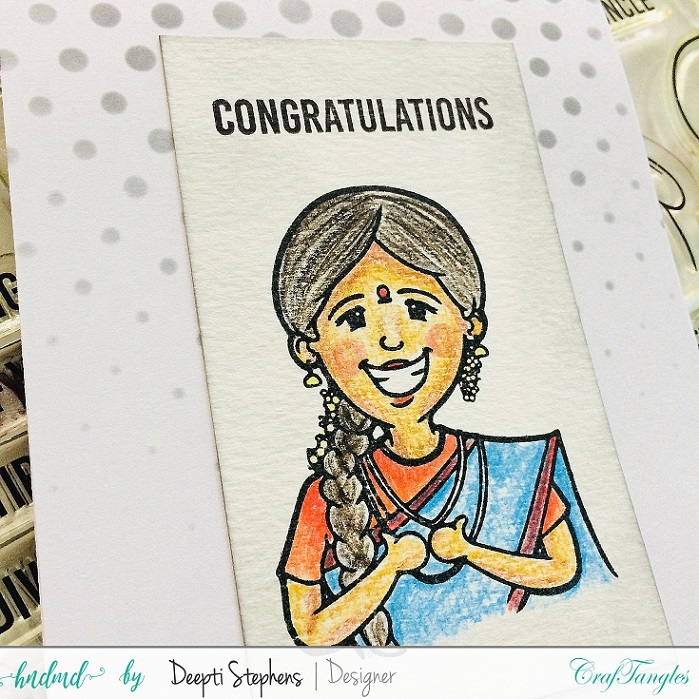 Welcome to Craftangles October Blog Hop. 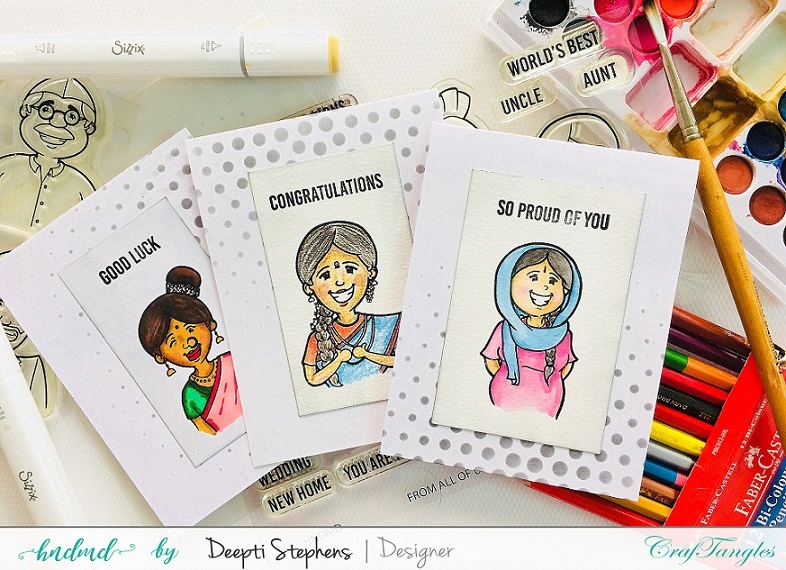 The theme for this hop was sharing Ethnic cards using new EID/Diwali/People of India from the newly released collection. 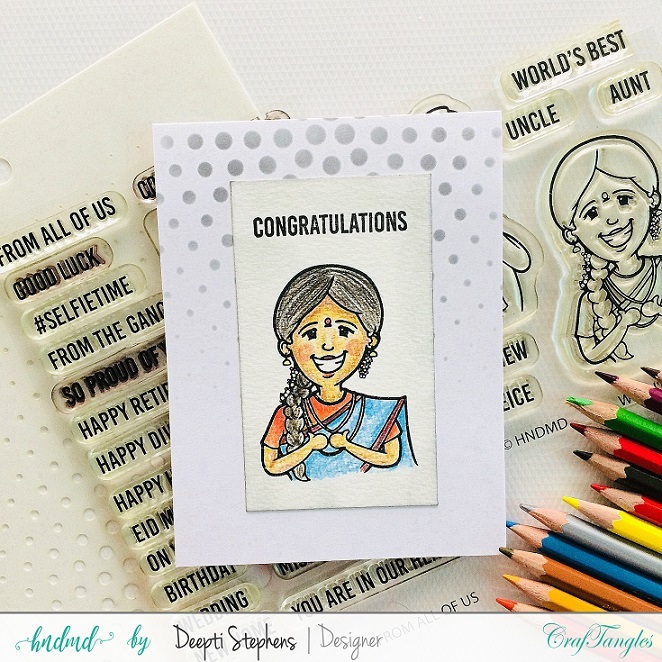 Here I have used People of India, From all of us, World's Best stamps and Sunburst Stencil from Craftangles. I have used different coloring mediums - Color Pencils, Water Colors and Alcohol Markers on these women. I think they turned out really beautiful. What do you think? 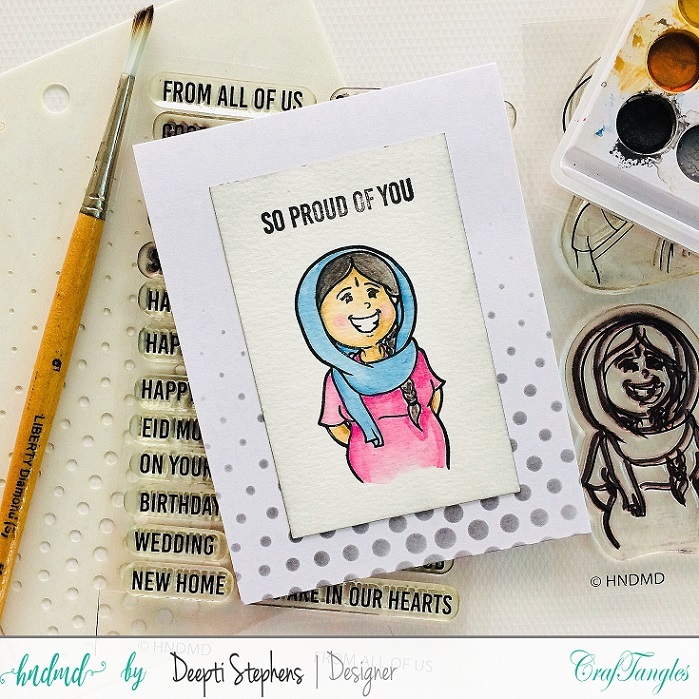 I started by stamping the beautiful image from Craftangles World's Best stamp set with Memento Black Ink on Canson Watercolor paper. Then I colored the image with Faber-Castell Color Pencils. I went with lighter shade first and then moved onto the darker shade. I chose water color paper because of the added texture which is very helpful for the colors to blend while coloring. Don't go too harsh on the paper, start with light strokes and then build up the color. I took an A2 sized card, placed the Sunburst Stencil and blended in Black Soot Distress Ink through it. 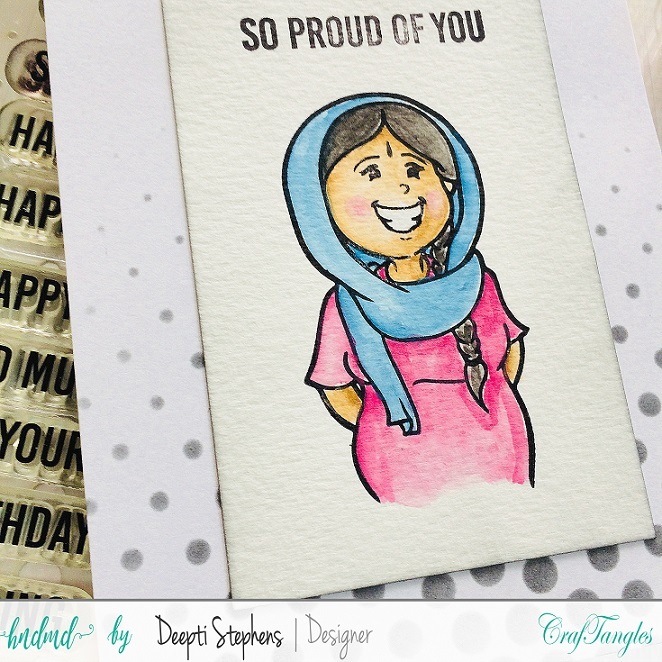 Finally Stamped the sentiment from From All of us and finished the card by adhering the colored panel over the main card base. 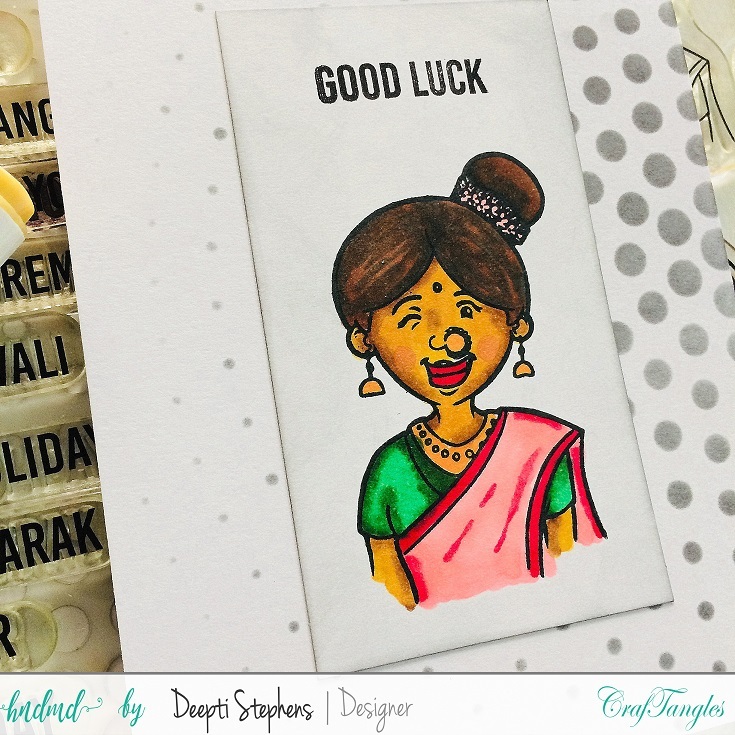 This one was also similar to previous card design but I used Sizzix Permanent Markers for coloring the image. These are alcohol base so I used an alcohol friendly ink, Memento Tuxedo Black, to stamp the image. 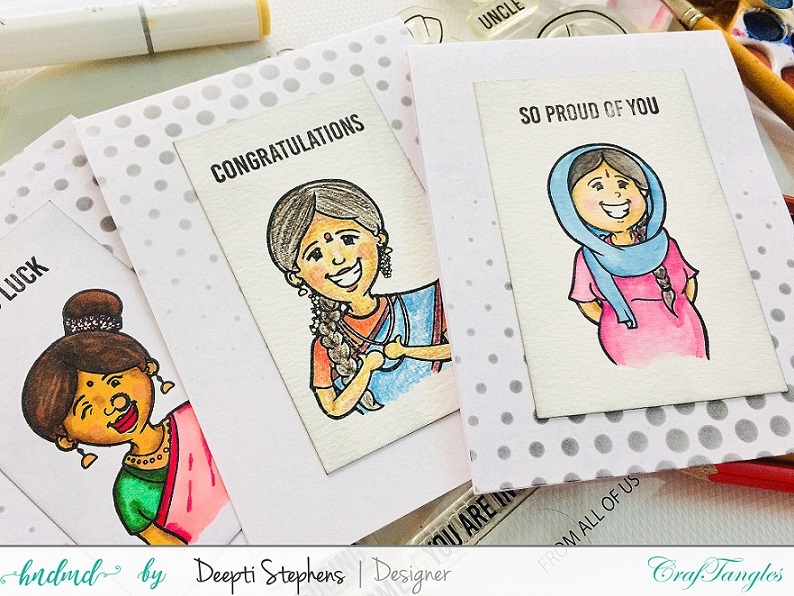 I used People of India, From all of us Stamps and Sunburst Stencil from Craftangles. This is the last one and also similar to previous cards. I stamped the image in Archival Jet Black Ink which is permanent, water proofed and fast drying, on Canson Water Color Paper and Water colored the image with School Watercolors from Camel. I started by die-cutting the Holiday Greens and Garden Greens Thinlit Dies out of Canson Watercolor Paper and water colored them with Candied Apple, Vintage Photo and Peeled Paint Distress Inks. Next I distressed the background panel with Candied Apple Distress Ink and then added stripes with water and Picket Fence Distress paint. Then I added splatters of water and Picket Fence ink with paint brush for the snowy effect. To the edges of the card panel I added Picket Fence Distress Paint. 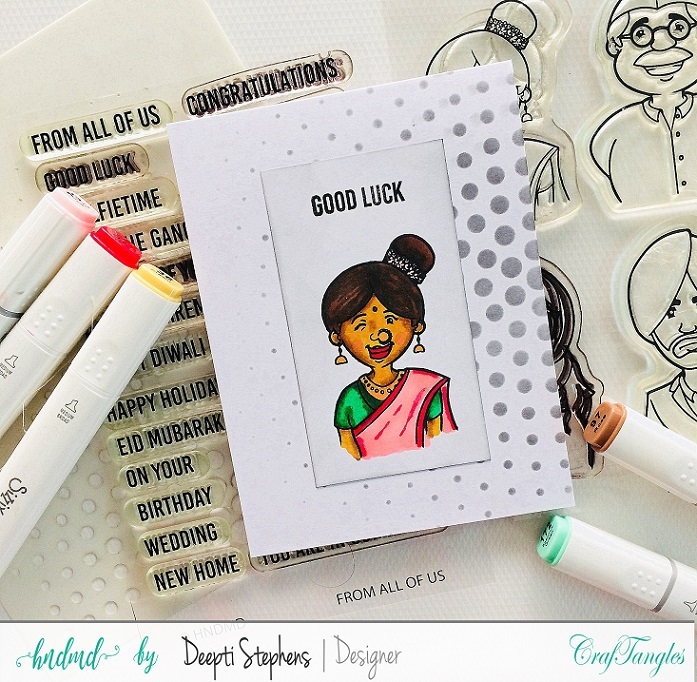 I adhered all the water colored die-cuts with Tacky Glue and stamped the sentiment from CP Designs with Archival Jet Black Ink.